If you consider on continuing the group lesson(s) with Queens, you can always go down to group 2 again, if you feel that group 3 is too difficult for you. The coaches usually do not mind. * Foxtrot - edges, timing, pattern - getting the timing better for the lady's mohawk. * 14-Step - that's improved. Mohawk no longer so scary since partner has got timing better. * Starlight Waltz - just how may ways are there to hold your partner incorrectly whilst going for that first lady's mohawk (careful how I phrase that )? Wrong arm position - too firm, too stiff. Wrong body angle. Still, it seems to be getting better. Change hold 3-turn - improving. Thanks for the advice. The whole group 2 / group 3 thing has turned into quite a big deal for me. The thing is, I was stuck in group 2 for a year and didn't make any progress for ages. 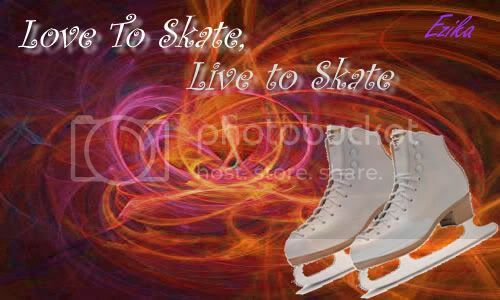 So I started skating elsewhere at the beginning of the year with the intention that when I went back to Queens, I would be good enough to go into group 3. I do'nt think I'm there yet. 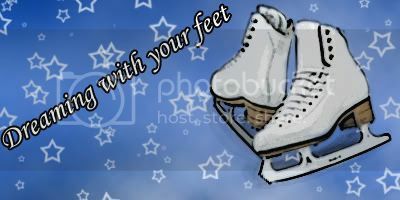 After the lesson I practiced the three jump from a relative speed and also managed to make some progress on the salchow. Just wanted to introduce myself on the forum now that we've met properly hehe! You were in my group in Adult Development (I was with my Chinese boyfriend if that helps!) - I'm glad you enjoyed the session! I really am glad that I was brave enough to come, as I really did enjoy it! I struggled with a lot of things - including the back 3-turns and the back crossrolls, but it's nice to give lots of different things a go! I saw you try dancing with Jeff (sp?) after the session - how's that going? I really enjoyed tonights adult developement! Unfortunatly it will be the last one I can go to as I am moving to Bristol on Friday for uni !! Really going to miss Nottingham. Well, I hope that uni goes well when you go back Enjoy the skating, and see you at Christmas maybe? Becky, Amber, that sounds a great set of things to do in a lesson. I hope to reach the standard where I can do those too one day. Daydreamer, I hope your cough is something trivial and you don't end up incapacitated for days on end like hanca was - we need you to be fit for the 10th October! Today I worked on my confidence in my own skates (completely shot since the first time I wore them I fell over about ten times in as many minutes, with the last one resulting in a very painful tailbone injury!). I managed to get across the coned off area (no holding onto the barrier!) for the first time in my own skates! Very happy, although most of it was backwards lemons, lol! I find them easier than forward skating (constantly jab in my toepick! ), but even that is improving... slowly. That was in April. What a difference! Mysique, I would love to be able to do a bunny hop. I'm sure I could do one without too much effort but I'm not 100% sure what one is! Ice Mouse, I look forward to seeing your newly discovered skills when we skate together in October. I ought to try chassés again as it's been a few weeks. I am going to attempt a small group lesson tomorrow. If it's successful it will be more due to pharmacology than my arm healing! I'm going to be dosed up on so many things when I leave the house that if I fall at the rink, I'll rattle! Then we worked on the tango, cause I had struggled with it on tuesday. I get confused and left behind lol. I think I more or less get the steps now, until the very end with crossovers and swinging through. Except I'm doing crossovers instead of runs. She asked me if I liked the foxtrot and I was like "yeeees" rather unconvincingly lol. I know it's good for me to practice edges and stuff, but i find it a bit boring. Then we went onto level 6 and did backwards chasses which she said could be a pass if only I could keep my feet together. And I think i need to hold my outside edge a bit better and for longer as well. We started on three turns, but then decided to work on forward drags, cause they're in one of the routines for the show and I've never been shown them properly before.